Combine the cream, sugar and vanilla essence in a pan and slowly bring these to the boil. Meanwhile, soak the gelatine in cold water until soft. When the cream begins to boil, remove it from the heat. Remove the gelatine from the water, squeeze out the excess, place it into the cream and whisk vigorously. Allow the cream to cool then pour this into the buttermilk, whisking continuously until it has completely emulsified. Pour the mixture into dampened moulds then refrigerate, allowing at least two hours to set before serving. Combine the sugar and water in a pan and slowly bring these to the boil with the star anise to create a syrup. Place the prepared rhubarb into a deep baking tray then pour over the syrup until the rhubarb just floats. Cover the tray with foil and braise the rhubarb in the oven at 180 degrees until just tender. Once cooked, remove from the oven and pass the mixture through a colander to separate the rhubarb and the syrup. Cool and store the rhubarb in the fridge, retaining the syrup to decorate your plates, again, storing this in the fridge until you need it. Cream the butter and sugar together in a mixer until light and fluffy. Add the eggs then re-whisk until the mixture returns to a light, fluffy state. Sieve the flour and ground almonds into the mix, add the flaked almonds and fold together, being careful not to beat out the air. Spread out into a lined baking tin until approximately one inch thick and bake at 180 degrees for 30 minutes or until just set. Once a knife or skewer can be inserted and drawn out clean, remove the biscotti mixture from the oven and allow this to cool. Once cool, slice the biscuits into fingers. Place these on to a lined baking tray and re-bake at 180 degrees until crisp and golden. 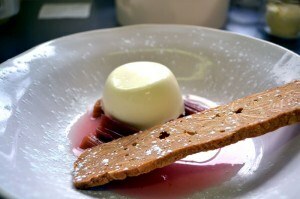 Turn the buttermilk pudding out on to a plate and surround with four or five sticks of the stewed rhubarb. Drizzle with rhubarb syrup and place two biscotti on the side of the plate.